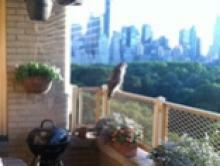 Famous 5th avenue resident hawk flew from his home base to Wendeen’s terrace. The hawk politely eyeballed the sunset supper whipped up for friends. iPhone cameras rolled with Andy, Joe, and Sandy bringing the spectacle into focus. Sandy got perfect pic during hawk’s 20 minute preening gig.